Proprietary Name: No-scar Oint. What is the Proprietary Name? Non-Proprietary Name: Centella Titrated Extract Neomycin Sulfate, Hydrocortisone Acetate, Neomycin Sulfate What is the Non-Proprietary Name? No-scar Oint. 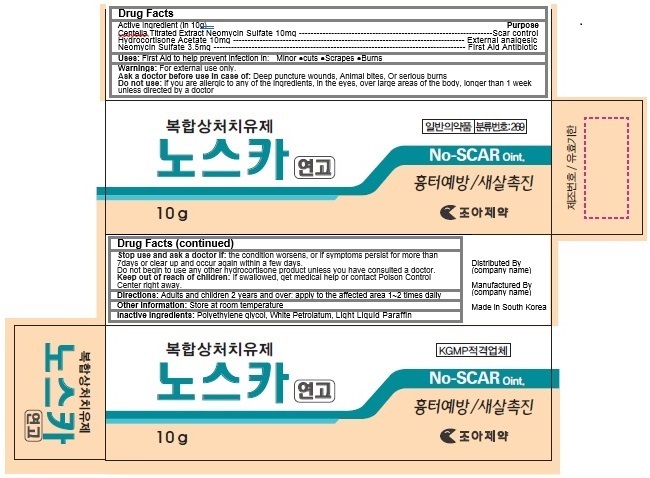 with NDC 58354-113 is a a human over the counter drug product labeled by Cho-a Pharm.co.,ltd.. The generic name of No-scar Oint. is centella titrated extract neomycin sulfate, hydrocortisone acetate, neomycin sulfate. The product's dosage form is ointment and is administered via topical form. Dosage Form: Ointment - A semisolid3 dosage form, usually containing <20% water and volatiles5 and >50% hydrocarbons, waxes, or polyols as the vehicle. This dosage form is generally for external application to the skin or mucous membranes. Stop use and ask a doctor if: the condition worsens, or if symptoms persist for more than 7days or clear up and occur again within a few days. Do not begin to use any other hydrocortisone product unless you have consulted a doctor.